Here are some protips to make your blog more professional. Blogger by default shows a navigation bar at the top of your blog. Staying with the navigation bar makes it looks like you didn't put effort into making your blog look good, and make you look unprofessional. 1. Select the blog you want. 2. Go to template and choose "Edit HTML". A pop up will show up, select Proceed. Some of the templates on Blogger use different color for the standard colors used for links which are blue for a link and purple for a visited link. Avoid using different colors to not confuse your visitors. I consider it a must to add at least one photo to every post which is related to it. 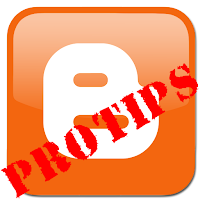 It will make your post more lively and will give the reader a quick hint about what the post is about. Adding things like "Popular Posts", or list of labels to your blog will expose your visitors to other content you created. It may interest some of the visitors and will make them stay and read another post. Give them the ability to follow you so they'll have a way to find out about new content you created that might interest them. Things like Twitter, Facebook, and Google are great popular tools to do it. Let people know you are there! This is perhaps the most important tip I can give you. Let people know about your blog! If you won't do so it is most likely people won't find your blog, and you will get very low traffic. A good example about how to do this is to go to some forum which is related to your post, make there a thread with a short explanation about what your post is about and give a link to it.